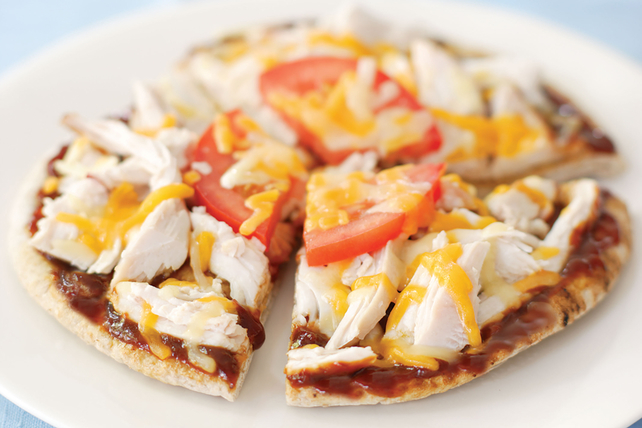 Get a taste of summer no matter what season it is with our BBQ Turkey Pita Recipe. Ready in just five minutes, this unconventional turkey pita recipe has the tangy, smoky BBQ taste you adore. Spread pita bread with barbecue sauce; top with remaining ingredients. Microwave on HIGH 1 min. or until cheese is melted. Prepare using KRAFT Shredded Cheddar & Monterey Jack Cheeses and OSCAR MAYER Deli Fresh Turkey. Serve with a small mixed green salad and piece of fresh fruit to round out the meal. For an extra smoky flavor, sprinkle with 1 Tbsp. OSCAR MAYER Real Bacon Bits before microwaving. In addition to the cheese adding the perfect finishing touch to this warm sandwich, it also adds a good source of calcium.